Well, that depends upon the treatment philosophy and skills of your prescribing doc. And your questioning and decision-making skills come into play, as well. Generally speaking, yeah – I think your fears (how ’bout we flip to “concerns”) are warranted and wise. In fact, a recently published meta-analysis (combines the results of multiple studies) suggests off-label use of atypical antipsychotics may do more harm than good. Okay, I want to make sure you get the max from this article. So let’s learn a smidge about the atypical antipsychotics (aka second generation antipsychotics, atypicals). As the name implies, the atypicals work to relieve psychotic symptoms. But in addition to being FDA approved for schizophrenia; the atypicals have also been approved for acute mania, bipolar depression, agitation, bipolar maintenance, and then some. 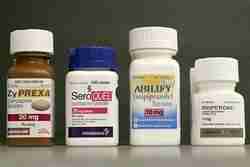 Some of these approvals are for adjunct (add-on) use with other medications. Of course, they can be prescribed for circumstances beyond their FDA approvals. And that’s known as off-label use. The hype of the atypicals has always been they’re less likely to generate side effects that impact the extrapyramidal system (part of the motor system that’s involved in the coordination of movement) than the first generation antipsychotics. But don’t be naive. The atypicals can still produce mega-nasty side effects including tardive dyskinesia, neuroleptic malignant syndrome, and increased risk of stroke, sudden cardiac death, blood clots, and diabetes. And then there’s the potential for significant weight gain. The atypicals include aripiprazole (Abilify), olanzapine (Zyprexa), paliperidone (Invega), quetiapine (Seroquel), risperidone (Risperdal), and ziprasidone (Geodon). Let’s check-out the details of this very telling work. The lead author, by the way, is Alicia Ruelaz Maher, MD, assistant clinical professor in psychiatry at the University of California, Los Angeles, School of Medicine. It was published in the September 28, 2011 issue (is chipur current, or what?) of the Journal of the American Medical Association (JAMA). Dr. Maher and team confirm that atypicals are commonly prescribed – off-label – for situations such as dementia-associated behavior issues, generalized anxiety disorder (GAD), obsessive-compulsive disorder (OCD), eating disorders, substance abuse, and posttraumatic stress disorder (PTSD). They point-out the practice has doubled over the past few years. Also confirmed was, in some cases, off-label use of atypicals may work well. Regardless, Maher and team wanted to dig a little deeper. So they rolled-up their sleeves and reviewed some 160 good-news efficacy trials conducted through May 2011. They also considered some 230 studies assessing adverse effects. Within the realm of the situations we just discussed: In elderly dementia patients with symptoms such as psychosis, mood alterations, and aggression; several atypicals brought a small, but significant, positive change in behavior. When it came to treating generalized anxiety and obsessive-compulsive disorders, the use of atypicals brought moderate improvement. No evidence could be found to support using atypicals for the treatment of eating disorders or substance abuse. And the results for using an atypical in the treatment of a personality disorder were mixed. Off-label use of atypicals may show moderately successful results; however, the disorders for which they may work are few. Physicians can no longer blindly prescribe atypicals for off-label use. They need to seriously consider all aspects of a prescribing situation and decision. One of the aspects that can’t be ignored is the very high-risk for side-effects. For example, in the elderly, the risks include urinary tract issues, stroke, extrapyramidal symptoms, and death. In the non-elderly, we’re talking at the very least weight gain (especially with olanzapine), extrapyramidal symptoms, fatigue, sedation, and akathisia. As it may apply to you – certainly, you’re the one who has to make the decision. However, the ball remains very much in your physician’s court. I would think she/he would have considered your medical and psychiatric history before making the recommendation. Still, how ’bout asking exactly what went into it? “Am I medically more prone to side-effects?” “Are there alternatives?” And more. One last thing. If I were going to give the nod on off-label use of an atypical, I’d sure as heck want to make sure I had all of my treatment bases covered. I’m talking about using psychotherapy, as well as being in the groove with healthy lifestyle habits. All things considered…the decision is all yours! Would you like to read more chipur articles on meds, supplements, and devices? Click away right here. Next Post: At Wit’s End? To the Wall With You!